Installing the web services requires IIS. This will document how we configure web services for two volumes RC1 and RC2. 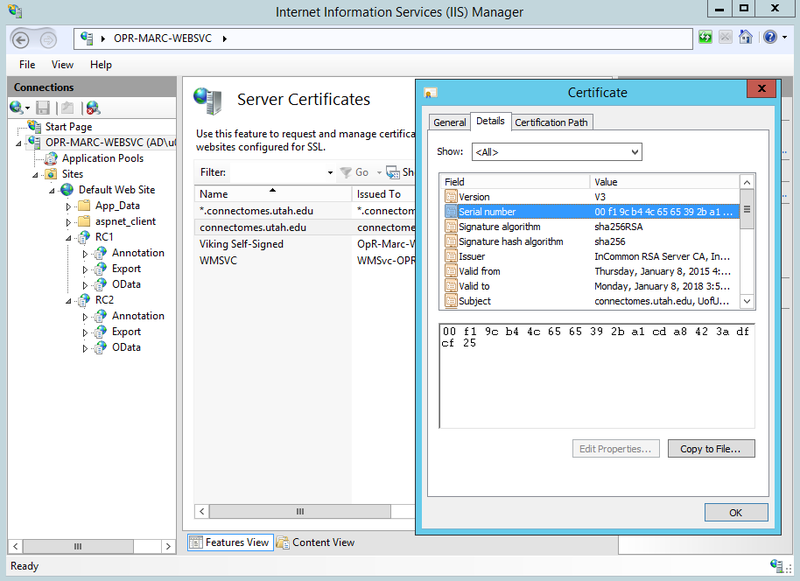 IIS must be installed on the machine with WCF and .NET 4.0 support. Screenshot of our IIS installed roles. Either generate a local SSL certificate or obtain an official one. Viking’s annotation service refers to the certificate by serial number in a later configuration step. The serial number can be found on by viewing the installed certificate. Load the Server component solution in Visual Studio. Open the web.config file of the AnnotationService project. Update the serviceCertificate node’s findvalue attribute to match the serial number of the certificate you will be using. This step is only required if you will be writing to your own annotation web service. 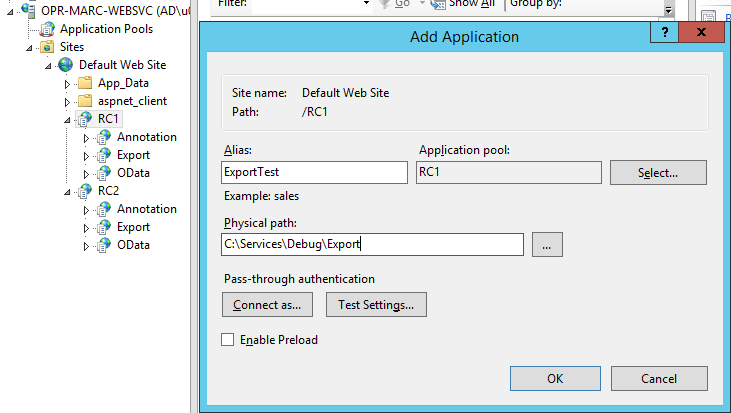 The OData and Export projects can be configured to point at an existing web service. Annotation Service This project has to be manually built as both Release and Debug and deployed to the relevant diretory. We prefer to upgrade all of our services with a single copy. To accomplish this we copy the deployment directory to a folder outside of IIS. 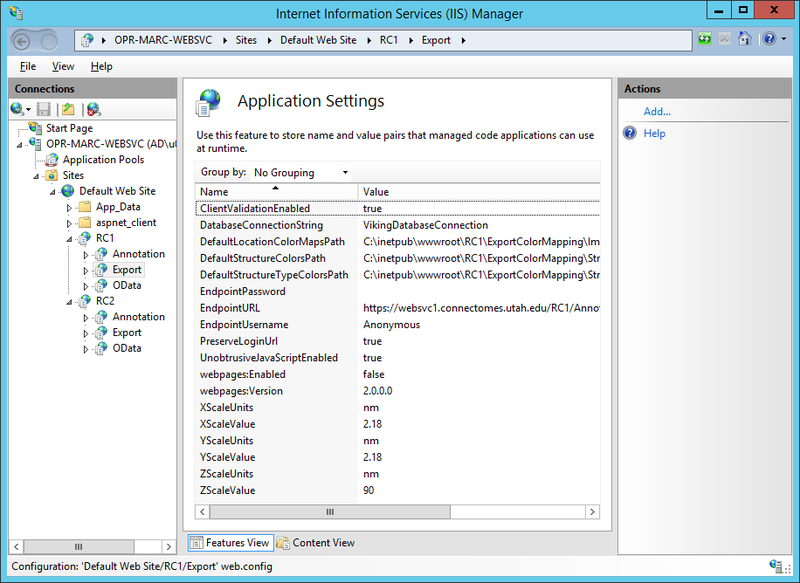 The volumes in IIS will all point to this directory as a virtual directory. When we update the binaries here all volumes will be upgraded. Each volume gets its own application within IIS. We create a folder for the volume under the root website. Note the ExportColorMapping folder under RC1 which will contain the default color mappings used by the file exporter web service. There is a default web.config file which arrived with the deployment directory. This file contains the default values for all of the application settings. Copy this folder to the root of your new volume directory. In this example it would be copied to C:inetpubwwwrootRC1web.config. These settings will be updated in a later step. Below shows the application pool for the volume. If the database is on a remote machine you will need to create an active directory account for the application identity. If the database is local the application’s identity is sufficient. 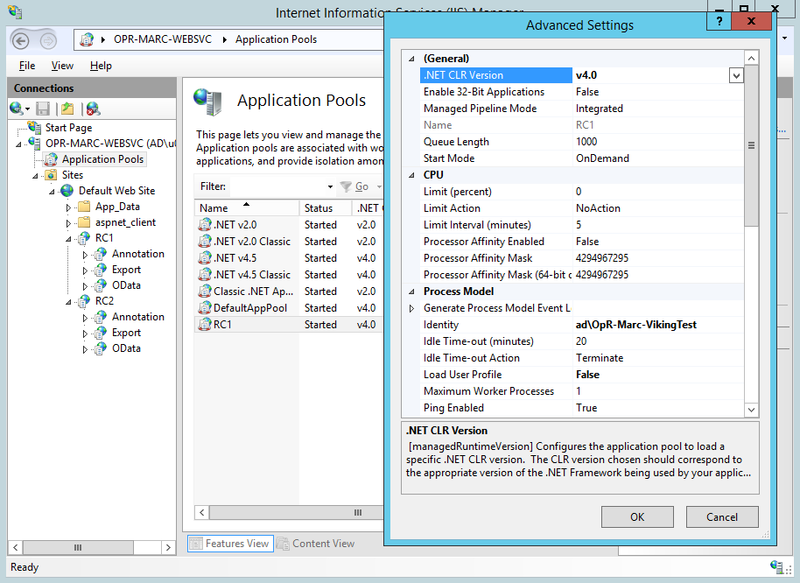 The application pool must be configured to use .NET 4. It is possible to share the application pool across multiple volumes. In our production server we assign a separate application pool to the annotation service which has write permissions to the database. Open IIS manager and open the website containing the folders you created above. If they appear to be normal folders right-click the folder and choose “Convert to Application”. Assign the application to the .NET 4.0 application pool you have created. Create a database connection string, VikingApplicationServices, for your membership and roles database. The default web.config for a Viking volume expects this connection string to be configured. This database must be an ASP.NET SQL roles provider database. Create a database connection string, VikingDatabaseConnection, for your annotation database. The default web.config for a Viking volume expects this connection string to be configured. For each web service add a new application to the volume application. In the image below we are adding an ExportTest application to the RC1 volume. Open the application settings for the volume application. These settings will be inherited by the child applications unless overridden, so we configure at the root application level. 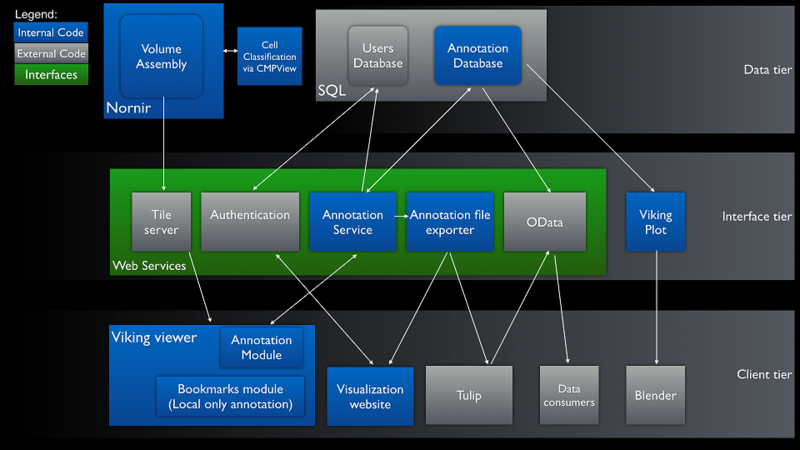 Annotation and OData service. The IIS connection string to use when talking directly to the annotation database. VikingDatabaseConnection by default. Default configuration file to map location positions to colors. Default configuration file to map strcture IDs to colors. Default configuration file to map structure type IDs to colors. URL of annotation service to use when exporting data. Username to use for annotation service endpoint, should be a user with read-only access, we use anonymous. Password to use for annotation service endpoint. Pixel to measurement unit mapping. Units of measure for pixel scale, defaults to nm. The configuration of the web services should be complete. Please let us know if these instructions are missing any steps.